Hi, there! Welcome to Flawed yet Functional! I am a Type 1 Diabetic managing my blood sugar level through diet, exercise, and healthy habits. 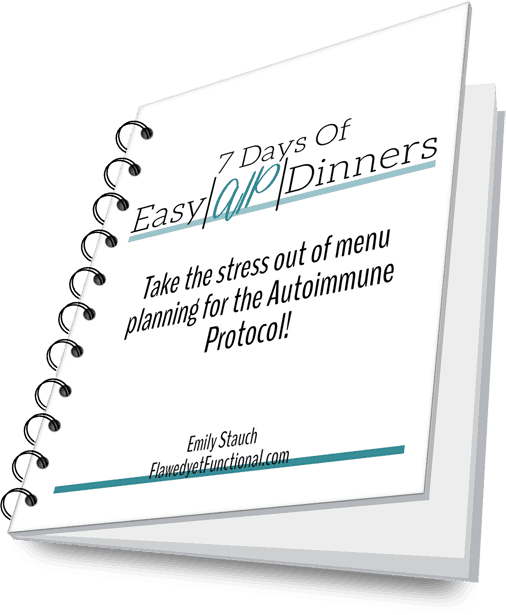 Holidays can be tricky for anyone trying to maintain health and minimize waste. I threw together this leftover-eliminating, gluten-free, and dairy-free shepherd’s pie this weekend, and it was so good! Holidays don’t have to mean loads of trash for the garbage men! After the turkey is completely used up, the next step is to eat all those leftovers! Paleo Turkey Shepherd’s Pie from Thanksgiving Leftovers can use all the vegetables you’ve got, creating a “new” meal and less waste! A holiday victory, right?! Shepherd’s pie is a great way to use a variety of leftovers from your holiday meal. I used the leftover fresh veggies from the vegetable platter to mix in with the meat. That 1/2 cup of leftover gravy became the base for my sauce coating the meat and vegetable mixture, and the turkey broth from the neck and organ meat provided enough extra liquid to make the perfect sauce. Any type of leftover mashed vegetable is a great topping. I happened to have mashed sweet potatoes, but you could put anything on top: regular mashed potatoes, mashed cauliflower, or mashed parsnips. Whatever mash you have, use it! As you read through my recipe, don’t limit your shepherd’s pie to the leftovers I had on hand. Got green beans? Chop them up and add to the meat mixture! Broccoli and Cauliflower from a veggie tray? Chop small and saute with the onion before adding the meat! Use all the things! Completely by accident, I made this a one-pan dinner! Normally, I pour the meat and vegetable mixture into a glass 9×13 pan then top with mashed vegetables and bake it. The maid at this house has not kept up with dishes this week, so there were no clean baking pans when I was ready to bake. None. Zilch. Feelings of frustration rushed in as I thought of the work to swap food out of a pan and then wash it. Then I realized…I can bake it in the dutch oven I have the meat and vegetable mixture in! So to make this recipe easier on you, begin with a dutch oven that is oven-safe. I used a 6 quart enameled cast iron dutch oven. The sides were a tad high for proper browning, but that is a sacrifice well worth making for the sake of less dishes! Check out the recipe below and use up all those bits and pieces of holiday leftovers! Paleo turkey shepherd’s pie from Thanksgiving leftovers is the perfect catch-all dish to use up whatever you brought home from your holiday gathering! Need a meal for all the bits and pieces leftover from your holiday gathering? 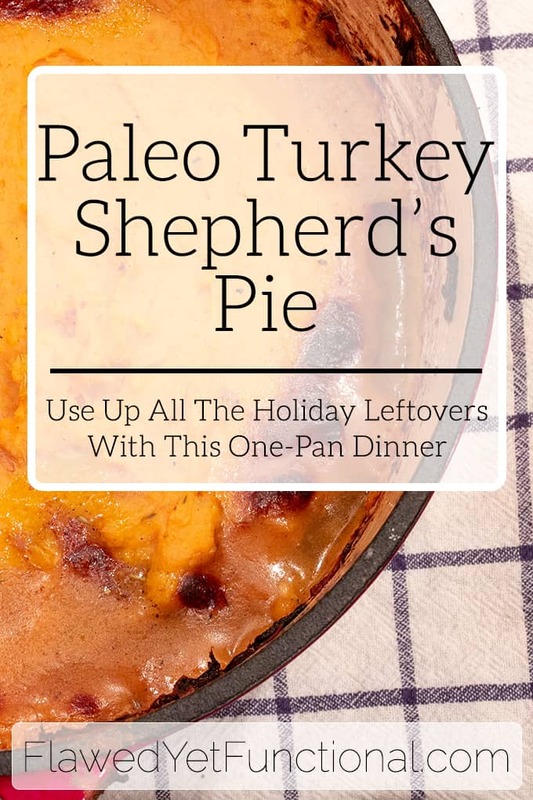 Look no further than Paleo Turkey Shepherd's Pie! Whatever your assortment of fresh or cooked vegetables, meat, and gravy, you can throw together a delicious, "new" one-pan dinner tonight! Preheat oven to 375°. Heat oven-safe dutch oven over medium heat then add olive oil. Add onion, carrots, and celery along with a good sprinkle of salt and pepper and saute until just soft. Add spices (sage, thyme, rosemary, salt, and pepper) to vegetables and cook for 30 seconds, until fragrant. Stir in turkey meat and gravy, then add enough broth so the liquid is just beginning to pool over meat/vegetable mixture. Do not completely submerge! That will be too much liquid! Bring to a boil and taste for seasoning. Add sea salt and pepper as necessary. Remove from heat. Mix arrowroot powder and water in a small container then stir into meat and vegetable mixture until thickened slightly. Spoon mashed vegetables onto the top of the meat and vegetable mixture. Spread out to smooth, covering the meat/vegetables completely. Turn off oven. Turn on broiler. Broil until desired browning occurs, 3-5 minutes. Enjoy!